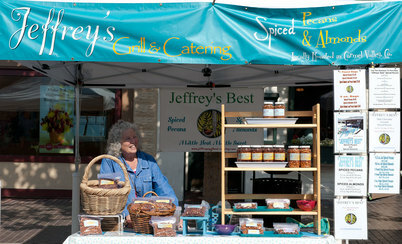 "Jeffrey's Best" Spiced Nuts & Granola is Now Available for Purchase Online! Chef Jeffrey's original spiced nut recipes are created from scratch with the only best of fresh ingredients, in Carmel, California. most indulgent cravings! Be sure and share with your friends! "Jeffrey's Best” Spiced Nuts are available for purchase in Jeffrey's restaurant, here online, at Star Market in Salinas, Bruno's Deli in Carmel, as well as at the Monterey Farmers' Market every Tuesday, on Alvarado Street! Please pick up a few jars at a location near you, or shop online with the easy click of a button now!! 831-899-0992 or email us at SpicedPecans@JeffreysGrillandCatering.com. We aim to please and fulfill all order requests. To learn about delicious news to come from "Jeffrey's Best" Spiced Nuts, please click HERE and subscribe to our newsletter.